In the world of Save. Spend. Splurge. : Where ketchup chips are about to make it stateside | Save. Spend. Splurge. 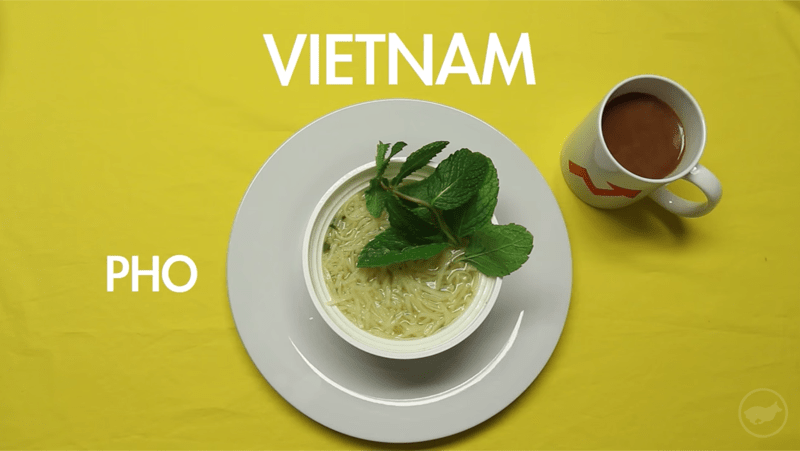 This breakfasts around the world video made me hungry. I would totally, absolutely chow down some major pho for breakfast and be happy with it. I have only just recently learned that there are these microfiber hair towels that can dry your hair a lot quicker than regular ones!? O_o .. Does anyone have any experience with them? Thoughts? I have been watching States of Undress is a fantastic series by Hailey Gates who goes around the world to learn about the history of fashion and dress in Pakistan, China, etc. It is both sad and enlightening. If you want a REALLY good beauty and skincare book that is no nonsense, try this one – Pretty Honest. I don’t own a hairdryer, but this ROTATING HAIRDRYER would be the first one I buy so that I could create long, beachy, gorgeous waves. I could never ever master the coordination of drying my hair and rotating a brush at the same time. This Starbuck’s barista’s doodles are epic. And he’s CANADIAN!.. and this father’s Post-Its to his children are beyond hilarious. Love this strappy, chunky-heeled sandal. It looks pretty darn good for its price. I know at least a few of you Americans who love ketchup-flavoured chips which are only sold in Canada, so you may find this news heartening. Love leather leggings but can’t go full hog (haha get it?).. try these slimming moto workout leggings with a few leather panels instead. Your top 3 favourite luxury brands on social media are Chanel, Louis Vuitton & Christian Siriano. I do admit to following Christian on IG @csiriano because of his inclusion of all types of body types, and he is a HUSTLER. That man knows how to make a beautiful dress, works like a demon (it is clear by his IG) and is one of my all-time favourite contestants on Project Runway. Still eying this lace-trimmed faux leather tote for under $50. Comes in black, navy blue and ivory. How much do you give at a wedding? I was told at least $100/head and more if you are closer to the bride/groom. I have however, heard of people giving $0. I am not sure how I feel about that, as they show up and eat the food & enjoy the festivities which sometimes puts the couple into debt. ← What is really beautiful for you in general? I am far less likely to give a wedding gift if I travel for the wedding – ie interstate, a five hour drive or internationally – I can feel cheap but I do value seeing them, and them me, more than a present. Agreed. I have traveled to weddings and have given the same $100/head + more depending on friends, but they have said many times (for the ones I traveled to), to not give anything because we had to fly there, etc. I’ve never been able to get on the microfiber hype train. There’s something about the texture and the way it absorbs water that feels so unnatural to me that I can’t get over it. It doesn’t soak up liquids like a cotton towel would. I have an Aquis towel and it is fabulous. I really feel like the wedding gift thing is dependent on the situation. I have always been told by my wedding inviters that my presence is the best present I could give. I’m in NZ and most of my wedding invites come from the US or South America (lots of friends have moved there!). So what if you live overseas and have to spend >$5K in flights, car rental, house rental, etc., to attend a wedding AND you are a very poor PhD student? I always give a small gift (would feel bad otherwise) but a >$100 gift on top of all the travel costs is a lot to ask! Friends that invite me to weddings always tell me no gifts if I am attending.